Sassco's first trophy since 2001. The overwhelming favourites are out-thought in the Final. 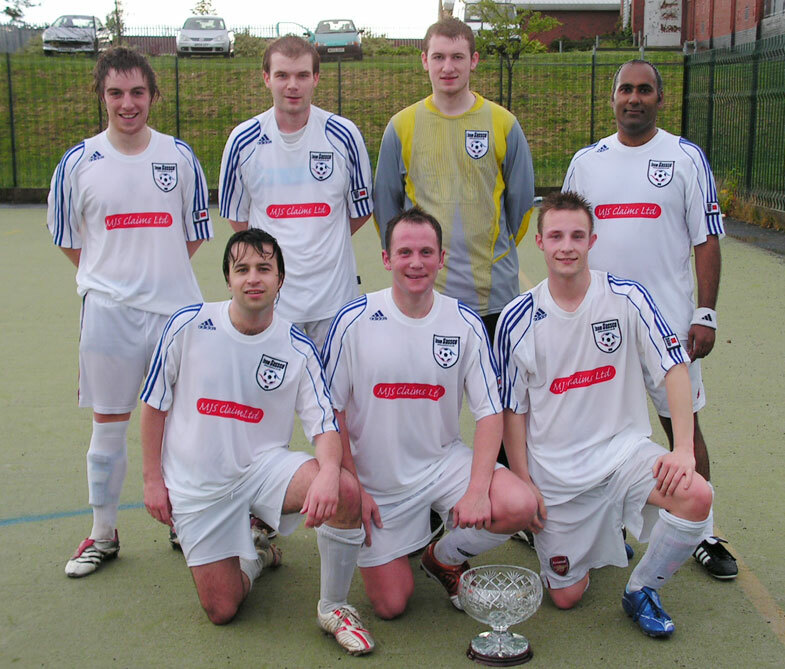 The winning Sassco.co.uk team, pictured with the CNSC Cup. Standing are Gareth Brazier, Chris Dixon, Kevin McClusky, Davinder Sangha. Sitting are Dave Gourlay, Mark Middlemiss and Anthony Yates. It was quite obvious after last week that Bunker were by far the overwhelming favourites to win the CNSC Cup. They'd destroyed Hylton Castle with some scintillating football in the Semi Final and were confident having had the better of Sassco in the League game played a few weeks ago. So, Sassco were facing a strong team. Charlie, Tommy Bell, Jimmy Raeper, Swinhoe were all there along with Bri Marley and Simma in goal. Paul McClusky also came in and Lewis - who had a blinder against Hylton Castle was at the heart of the defence. But as with many things, the favoured team sometimes struggle. Noting that Bunker only really had Brian Marley as a defensive player, Sassco decided to defend heavily as they did against Southwick in the Cup on Tuesday. The team they put out was the same side they'd had most of the season, Gourlay, Gash, Digga, McClusky, Yates, Middlemiss and Sangha. True to form, they suffered an early onslaught. Kev McClusky was called on several times, but couldn't do anything about the opening goal. It was 1-0, but Sassco soon got back into it and eventually went ahead. Gash scored a deflected strike and then Dave Gourlay put away a good penalty. It was the crucial third before half time which put Sassco in the driving seat. Mark Middlemiss, clear on goal "lashed" it through Simma in goal. The second half, like the first, was played in shocking torrential rain. It came down just before kick off and was relentless. It was probably the cause of some slip ups from Simma. One came in the second half to put Sassco 4-1 ahead. It was this time when Bunker inevitably came back into it. They grabbed a penalty which Charlie scored with ease and then Bri Marley scored a superb long range effort. 4-3 and the pressure was definitely on. Just as Sassco were looking to crumble, they got one back to make it 5-3. Dixon scored it and essentially it was over. Finally, Yatesy struck the sixth to bury the opponents and confirmed Sassco's name on the Cup. 6-3 was the final scoreline and a deserved one for Sassco. They defended well and in numbers and took their chances. All the side, apart from you-know-who scored. Gash scored two great goals after a stuttering opening. Dave Gourlay scored and Mark Middlemiss hammered in the best shot of the game. Sangha performed strongly in defence and McClusky made some tremendous saves in slippery and miserable conditions to see Sassco win their first trophy since 2001. The glass trophy is now proudly sitting in Kev McClusky's house (probably full of fruit or sweets) just there as a cruel reminder to Paul. This brings the Thursday competition to a conclusion. Due to the popularity and enjoyment for all teams, the next competition could be held within a couple of months time, depending on pitch availability. We might just consider a set of friendlies (with a referee) as it's probably fair that both Castle and Sassco should keep the trophies for at least a year. Hylton Castle hammered. Bunker v Sassco in the Final. A truly remarkable performance from Bunker. After a poor League which saw them face the ignominy of an Elimination game against Downhill (which was won handsomely), they had to face Hylton Castle, fresh from their Title success. Yet this performance was a drastic change from the heavy defeat in the League (which they lost despite leading). They drove at Hylton Castle from the start and gained two goals. This time, the weather was more to their liking and also they had an extra substitute. At 2-0, Hylton grabbed one back, but Bunker still persisted. 3-1, then 3-2. 4-2, then 4-3. Eventually they gained some breathing space. Goals from Raeper, Charlie, Bell, Lewis and Defty saw it go to 6-3. The amazing encounter ended 8-4 and Bunker are now clear favourites to win the Cup. * Bunker owe £1 for this game. Sassco, with Sangha in between the sticks, faced a depleted BarPure side. They opened the scoring, but Mullen struck a superb equaliser. Sassco then went 2-1 ahead and didn't really look back. The eventual score was 7-2 and BarPure had Carl Middlemiss to thank for keeping the score down. * BarPure owe £5 for this game. Hylton Castle take it again. Sassco's late comeback not enough. Another great conclusion to a thoroughly enjoyable tournament. Hylton Castle were hot favourites to keep hold of the trophy, as Sassco needed a victory. It didn't happen, but amazingly, the game mirrored the 2006 final game in that Hylton Castle stormed ahead. It seemed there would be a high score and humiliation for Sassco, but at 3-0, they made a comeback. Danny Hodgson kept both teams in it by firing two goals for Castle (Gowey scored the other) and then conceding a penalty. At this stage, it was 3-1. Gash Brazier had scored what seemed to be a consolation goal, but then proceeded to hit the penalty wide. Sassco paid for it when Coburn lashed in the fourth to make it 4-1. But then the comeback happened. Quite a few chances were missed at both ends. Sangha, in defence and McClusky in goal for Sassco both had exceptional games as being outnumbered, they still stalled the attacks. Sangha managed to block the ball with several body parts throughout the game. At the other end, Gash fired in a goal and so did Yates. But the more obvious ones were missed as Sassco ran out of steam. Good performances from Dixon and Mark M, but Hylton Castle deserved the win to take the Title. Coburn, Arny, Dorwood and Gowey were a massive threat during the whole tournament, whilst Danny Hodge and Pottsy held on strong at the back. Roll on next year, but before that, Bunker in the cup. A genuine hammering. Downhill were in to replace Town End, but inexplicably took on their form despite having some decent results in the Tuesday League as well as good recent friendly performances. Bunker were excellent. Charlie, Lewis, Bri, Paul McClusky and Swinhoe all looked comfortable as they fired in goal after goal. The game being so open saw Simma make some fine saves as Bunker face Hylton Castle next week in the Cup Semi Final. Hylton Castle and Sassco.co.uk showdown. Another sending off for Town End FC. A game which saw come back from 1-0 down to lead 2-1 ended in typical fashion. Hylton Castle came back strongly and had dozens of chances thwarted by the Town End goalkeeper. A penalty for Hylton Castle saw one of the Town End players being dismissed. The end result was an 8-3 win for Hylton Castle and a final showdown against Sassco next week to decide the Title - just like last season. Town End are suspended from Tuesday and Thursday until payment of £23 plus £5 kit fine are paid. All their cautioned players (3 in total) must pay their own fines otherwise they will not be allowed to play until they have. Hylton Castle 3-0 down - win 9-4! Town End start well, but end as normal. 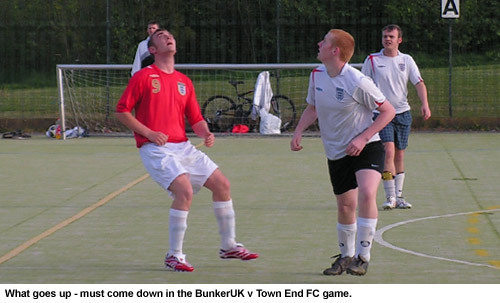 Bunker were 3-0 ahead against the favourites, but being an hour game, it simply didn't last. Fitness took it's toll as Hylton Castle came back strongly and secured an impressive win. For their most important game, Bunker failed to have any additional players which didn't help as the conditions were quite humid. Nevertheless, Hylton Castle put out an exceptionally strong side and now have their penultimate game against Town End before the decider against Sassco. Despite opening the scoring, Town End again suffered with lack of numbers and naivety at the back. BarPure equalised in the second half, but even after that, Town End came back strongly and nearly scored an amazing deflected goal which spun off the inside of the post. After this, BarPure finished Town End off with ease and a 4-1 scoreline. The win pushes BarPure into third which means that Bunker now have to play off against Town End in the Cup Elimination Game. Thanks to Anth Mouat for stepping in at the last minute to referee both games. Hylton Castle start where they left off. Sassco.co.uk claw it back against Bunker. BA great game played in sweltering conditions. Sassco had most of the play, forcing Simma into some good saves, but it was a breakaway late in the first which saw Mickey Donkin fire in a goal from the edge of the box. Sassco looked nervous, but Dave Gourlay scored an equaliser with a superb assist from Gaz Anderson. Yet again, Bunker came back and went ahead again, when Tommy Bell steamed in from the back to make it 2-1. It didn't last long. Keith Mouat, who along with Anderson, replaced Dixon and Gash, scored a superb goal to level it. Sassco had more chances, but Simma was on top form. At the other end, Kev McClusky made some important stops to prevent Bunker adding to their lead. Sassco's next game will be against Hylton Castle and it looks like they'll have to go into it looking for a win as a draw might not be enough now that a Hylton Castle, far superior to the one last summer, have opened their account. Chris McGowan, sorely missed in the important defeat on Tuesday, came up against two Youth players in Brown and Dinning in Hylton Castle's opener against BarPure. This time, he struck a hat-trick as Hylton Castle strolled to a win. Dinning actually pulled of several good saves, but BarPure looked nervous on the ball and failed to make an impact. Their remaining game is against Town End, but with two defeats, it's impossible for them to attain a higher placed finish. Five man Sassco outwit BarPure. Bunker were full-strength and performed superbly. They raced into a lead, but were pegged back by Town End FC. Lewis scored a hat-trick for Bunker as the eventual score ran into 7-3. Town End had two men sent off for essentially swearing at the referee. Both are fined £5 each and miss Town End's next game. A stunning performance from Sassco. They raced into a two goal lead with goals from Dixon. Eventually it was 4-0, with Gash and Gourlay getting on to the scoresheet. Second half saw Gash Brazier sent off, but Sassco moved up a gear by defending heavily and leaving Yatesy to finish the opponents off. It was 7-1 in the end. Ramshaw struck BarPure's only goal late in the game, but Sassco remain at the top, just as Hylton Castle will be making their bow next week against the hapless Town End FC. Sassco off to a flyer. 11-4 against Town End FC. Brave bunker undone by BarPure. A high scoring opening game. Town End FC were slightly depleted, but Sassco had a strong line up, albeit different from the regular Tuesday team. In came McClusky in goal, along with Gash Brazier, Dave Gourlay and Mark Middlemiss. Dixon, Yates and Sangha filled the other berths. For Town End, they still had a 'keeper problem and also lacked Nelson, and Garrett. Gourlay hit 6 for Sassco, while Yates scored 4 and Gash Brazier steamed in with the all-important single goal. BunkerUK.com were vastly depleted. Only Simma, Lewis and Raeper were recognisable from the Tuesday team. BarPure were featuring Mullen from Redhouse Youth's. An opening goal set BarPure on their way. Bunker were surprisingly resilient and it was both 'keepers, Carl Middlemiss for BarPure and Simma for Bunker who were the stars of the show. 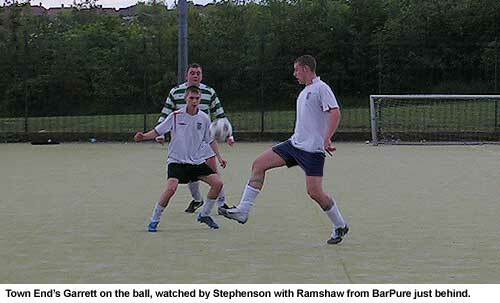 However, Mark Eden and Callum Collins scored the crucial goals for BarPure to set them away with an opening win. Hats off to Bunker, though. Once the full team is back, they will surely be up there challenging. Lewis (Bunker) was cautioned during this game. Five team competition - more could be added. As last season, the games last 1 hour each (30 minutes each way). It's still 6-a-side, but with roll-on and roll off substitutes. There will be only a maximum of two games on per night depending on pitch availability. At the moment only one slot between 7pm and 8pm is available. Each team will play each other team once and the winner in the four team League will be crowned as Champions. Current Champions are Hylton Castle. A cup competition might also be staged. Again, it will be a one-hour game with penalties to decide the winners if required. This will be immediately after the League. Southwell currently hold the Cup. Current cost per game is £15 and there is no entrance fee required. Due to keeping costs down, there are no individual awards. The winning team will keep the trophies until the next season though. Brief history on the Thursday competition. CNFL Season 1 was a huge success. It was neck and neck between Sunderland Select and InTune for most of the season. 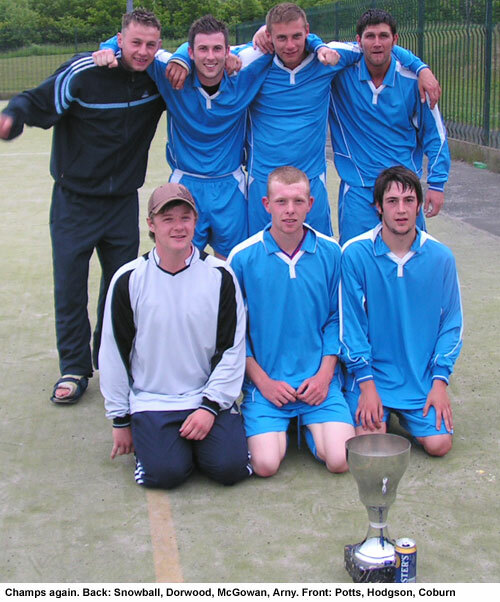 Yet Select, hardened from their successes on the Tuesday League broke clear and eventually won both competitions. CNFL Season 2 was abandoned not long after starting as I personally didn't control it anymore due to other commitments. It was then revived under the CNSC name with a good first season which saw SR-1 triumph in the League and Southwell in the Cup. The second season suffered the Thursday curse as teams dropped out - more down to the lack of organisation from the teams rather than the competition. The Title had to be decided in a Play Off which Southwell thrillingly came back from 1-0 down to win 2-1 against Wearview Elite in the dying seconds. There was obviously no cup competition. The third series was the strongest since the initial CNFL competition. Southwell again triumphed with Sporting Redhouse chasing them all the way. However, two teams still dropped out from a total of 8. Crucially, both the teams which dropped out were newcomers. The remaining six were modified Tuesday teams. This competition didn't have a separate cup competition neither. Season 4 was a drastic change. Played only as a summer competition, four teams from Tuesday were invited and the games were played as 1 hour games with one game played each week. Both Sassco.co.uk and Hylton Castle went head to head with both winning their games against Southview and Town End, before a final game thriller which saw Hylton Castle beat Sassco 4-3 to take the Title. 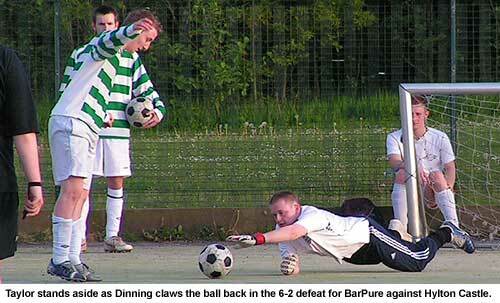 Previous article - 6-a-side memory lane.